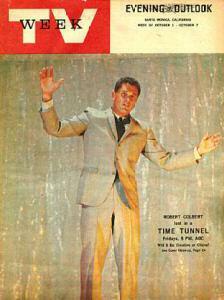 The Time Tunnel Robert Colbert Santa Monica TV Week Magazine. October 1, 1966. Features one-page article about the classic sci-fi show. Also features article and color photo on The Green Hornet. This magazine is original, complete, and in excellent condition.